snowdeal.org > ex machina: the eric update - day 306: beware the teething monster! the eric update - day 306: beware the teething monster! jeeez, louise. if odin's central incisors pop through this evening it'll be none too soon. frozen washcloths, teethers and gum massages are doing little at this point to alleviate his irritation. and while he's relatively content while he's awake to maintain a steady-state of manageable irritibility, his naps and nightime sleeping have pretty much fallen apart. quickly. perhaps benzocaine salves like anbesol or orajel are a short term solution? on the downside, more then one resource advices against oral anesthetics because they can numb the throat and cause choking. then again, maybe it's time to rub a little whiskey on his gums. joking! as always, anecdotes and advice are encouraged. Homeopathic chamomile is often recommended. I never used it--just went straight for the baby tylenol. My son popped all his teeth out in 6 months time; took a few months hiatus and then popped out the molars. Arrrgh. whiskey is not to be avoided because of your dispositions and false beliefs. the amount of alcohol is less than most childrens medicine dosages when rubbled on the gums, the sugars as distractions are not to be dismissed, not to mention other things that my happen. this is not to say 'give the baby a shot and put it to sleep' it is medicine like any other, that has served many people before you and will serve many after. I rubbed some oragel on a canker sore once...AHGH! That stuff stings in a way i doubt a baby would find pleasing. After the stinging subsided, it did numb the pain a bit, but mostly it just felt weird. I've never used it with my now 17 month old. When he seems to be really sufffering, and believe me, you'll know when he's really suffering, I dose him with a bit of tylenol. Normally I try not to give things like Tylenol or Motrin to him, but sometimes the poor thing just needs some relief from obvious teething pain. Good luck with those teeth, little Odin. I believe I heard or read somewhere oral pain soothers can actually toughen the gums, which makes it harder for teeth to break thru. "whiskey is not to be avoided because of your dispositions and false beliefs." weeeeeeell. as i said here, i'm quite aware that alcohol was ( and perhaps is ) a common teething remedy, but i think it has been fairly well established that infants do not metabolize alcohol the same way that adults and adolescents do and it's actually quite toxic to them. "Rubbing a bit of brandy, scotch, or other spirits, on the aching gums - a popular folk remedy for teething - is not recommended for children at any age. Even tiny amounts of alcohol can be toxic to a child and repeated exposure to the flavor of alcohol could give him a taste for the stuff." "It doesn’t matter how convincing your friends or relatives sound, but NEVER, under any circumstances, place alcohol into your baby’s mouth. A “dab of whiskey” is NOT okay. Alcohol is a poison to a young baby. Don’t do it." "Infants and toddlers have a clinical course significantly different from that of adolescents and adults. Ethanol ingestion and intoxication can lead to a marked hypoglycemic state in infants and young children..."
"In infants and children, ethanol intoxication often has an accidental cause. o Infants usually ingest alcohol as a result of their caregivers giving them over-the-counter cold medications that contain significant amounts of ethanol. o Also, parents may be misinformed about how to treat an illness. In some cultures, caregivers commonly give infants fluids that contain alcohol to treat colic, or they may even put whiskey in an infant's mouth to soothe the discomfort of teething. o In addition, infants and toddlers may be given ethanol orally or percutaneously. Usually, their caregivers do this to treat the child's cold symptoms. The parents may also give the child alcohol baths to treat a fever." so while you might feel it's appropriate to give toxic folk remedies to your child because "that's what grandma did it" - more power to you, i'll look for other options and not risk an accident when there are safer alternatives. and of course i'm not judging grandmas. someday we'll all be grandmas and grandpas and people will be shocked, shocked(!) that we every did x,y and z, even if it was from a lack of knowledge and seemed best at the time. and i'm open to the possiblity that we've entered into an age where the cultural pendulum has swung in the direction of excessive pruddishness when it comes to alchohol and infants; but it seems that there's enough evidence to support the conclusion that infants are disproportionally at risk for accidental poisoning, even from the small amounts in over the counter medicines, that irrationally exhuberant caution is warranted. Chamomile worked like a charm for us -- not just for teething, but any sort of bedtime upset (the dreaded "over-tired", frex). lolab: "That stuff stings in a way i doubt a baby would find pleasing. After the stinging subsided, it did numb the pain a bit, but mostly it just felt weird." "One of the few products on God's Green Earth that actually lives up to its promise from the adverts - it kills pain. Fast. Quicker than you can say 'Anbesol'. What they don't tell you - it's effective. Terrifyingly so. I swear, a few drops on a canker sore will numb your eyes, your hair, your whole head, and various random parts of your upper body. Once, I spilled Anbesol on my arm. I became a sideshow freak, able to puncture my flesh with bicycle spokes." oh, and thanks for the chamomile recommendations. we had tried soaking washcloths in chamomile before freezing and he didn't seem to care for them as much as the plain ones, so we just stopped using it. but maybe it's time to give it another try, since it's not the first time we've heard that it can work wonders. at the very least, it can't taste any worser than orajel and ambesol ( at least if my memory serves me ). any particular formulation work better than others? you just make "regular" tea and give the wee one a few tablespoons? We used a homeopathic teething remedy called Camillia, made by Boiron. It's got chamomile and belladonna in it at homeopathic doses and despite my skepticism, it worked quite well. For the record, they no longer put alcohol in children's medicines nowadays, but the booze should not be discarded outright. I find a couple of good stiff glasses of a nice merlot put me in a much better state to handle the fussies ;). Provided there is a sober designated baby handler to be had whilst I sleep, of course. AS for the anbesol/oragel, we've tried these in desparation. They work better on bug bites and didn't do much for the wee one. We tried anbesol on our daughter, a former 28wkr, and she choked on it, or her spit, I don't think we'll never know. She started throwing up and didn't stop until her stomach was empty. I threw out all the anbesol after that. Have you tried teething tablets found at health food stores? pumpkinhead: "...but the booze should not be discarded outright." thanks for the camilia recommendation, we'll have to add that to our bag of tricks if we can find it here in town ( perhaps our local health food store? ). Shannon Finley: "Have you tried teething tablets found at health food stores?" not yet, thanks! i'll admit that i hadn't even heard of such a thing. are you referring to the hyland brand that someone else also recommended or did you use another brand? 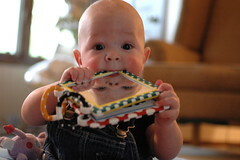 We have gotten many recommendations for the Hyland Teething Tablets you just mentioned. But we haven't tried them yet; our guy has been popping his teeth out without too much crying (a couple of night wakeups), just incessant chewing. But I hear the molars are hell, so I'm trying to save up sleep for those (ha!). Yes, yes, the molars are indeed hell. My boy has been working on his first set of molars for about 10 weeks now. #4 is halfway in and things are just starting to mellow out over here. Love that anbesol post, btw, hilarious. We've used the Hyland's with success! I don't know why it works or how it works, but they seem to decrease the fussiness little Isabella is getting with her little tooth that's pushing through...Other than that, my doctor recommended Motrin (haven't tried it yet though). Well, my son is a former 25 weeker and also has trbl with throwing up and how it affects him and his risk of aspirating when he throws up. He is currently in a full body cast. He is teething something serious. When he teeths I think it is making his head hurt so bad that he starts throwing up from being nascious (spelling). So I tried everything Tylenol, Motrin, cold this and that, orajel, you name it I tried it. SO of course e1 was telling me use whiskey I said I don't have whiskey I have tequila though. I was told to put some on a cotton ball and rub his gums. Mind you he had been throwing up at least twice an hour for about 5 hours at this point with absolutely NO relief wh atsoever. I did the Tequila and my son has been asleep for over an hour now. Maybe it's not good for them but throwing up could take his life with the swallow problem he has. So I made the decision and so far so good. Any other suggestions at 4:10 a.m. with no way to leave and get something else? i use a teething remedy which i bought at our chemist. You give 5ml 3 times a day, but i only give her 5ml in the evening, as it makes them a bit sleepy. Teeting rings and jels doesnt work for me. I must confest that i often worry of the possiblity of causing some kind of liver disfuntion in my baby, but once mentioned it to the pediatrician and said that it ok if i only give it to her once a day. It nums the gums, so she drinks alot better. Overall, she's not teething that bad, havent had sleepless nights caused by sore gums. Good luck.